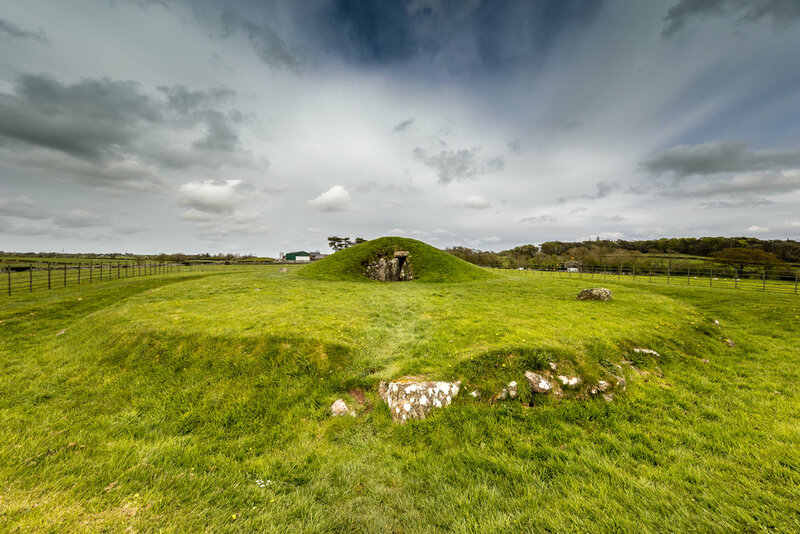 This dramatic chambered tomb rests on the isle of Anglesey in Wales, the 'ancestral home of the Druids'. In quotes because, of course, there has never been any evidence of such a thing and the story has only grown in the telling when Tacitus just made it up. Or really, the fellow that copied copies of Tacitus' work about 400 years after Tacitus supposedly made it up. It's fun of course, to fancy that Anglesey is in fact the ancient home of the Druids. But that lore isn't old or true. So while I still think it's fun to think of it when I tromp around these prehistoric places, I don't actually believe a lick of it. We just don't know. Beyond burial places, we just don't know what else they were used for. We can make all kinds of semi-educated guesses, but the real reasons are lost in the echoes of time and it will forever remain a mystery. As I've said plenty of times before, I actually *prefer* this non-explanation instead of the invented ones that people have tried to create. Not knowing is even better. This passage aligns with the rising sun of the summer solstice; as opposed to the Irish passage grave of Newgrange, which flirts with the winter sun. This once looked quite like a smaller version of Newgrange, though - at least they think so. But there are enough differences that they don't make a direct correlation. There is a large standing stone actually inside the tomb, which is pretty dang cool when you think about it. The site also began in 4000BC as just a henge monument (an earthen mound and ditch) but had erected standing stones by 3000BC. 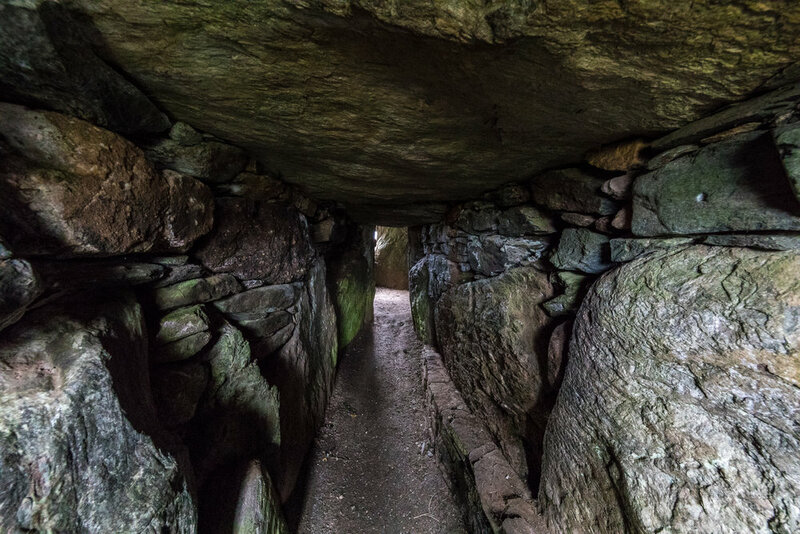 About a thousand years had to pass before the stones were torn and knocked down and used to make the passage grave. Archaeologists differ, by the way, on this. Some think the stone circle was first, some the passage grave. They cannot seem to agree on which came first. One of the standing stones which has survived has beautiful swirl carvings on it - the one at the actual site is now a replica, the original they yanked out and put in a museum in Cardiff. It also seems like humans have intervened on the site in the past 100 years, as is often the case, actually, with neolithic tombs. They have come in and tarted them up a bit from their 19th century dilapidated state. There is no written record of it happening, but of course one can clearly see what it did look like in this 1847 drawing of the site. It is so different to what we can see now I can hardly reconcile it is the same location. I'm actually a bit skeptical. Now that I look at the image a bit more carefully, this looks like the approach; the west side. The 'entrance' would be across to the other side and so the length of the passage cannot really be determined by this drawing. In any case, people went in and re-covered the stones with earth - as they should have been in antiquity - and just didn't mention it. This actually happened quite a lot with burial mounds and tombs in Britain in the early 20th century. I think it's really wonderful actually that the local people were interested in their ancient past enough to help become caretakers to their heritage. Covering them back up serves many purposes, not the least of which is helping to preserve them for centuries to come. Nevermind the fact that they actually were covered with earth! It's just a shame that no one has done a comprehensive study of welsh folklore. It is almost as if people just stop looking at the Mabinogion. Oh, look, a big gigantic epic mythic tale. There ya go Wales, you have your stories, now let us get on with paying attention to England again. Meh.